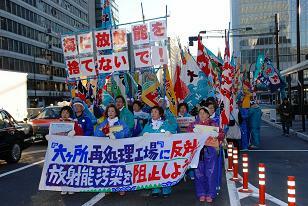 Lots of activity here in Japan against the Rokkasho Reprocessing Plant in Aomori Prefecture… 596 organisations and groups, and 2,500 people participated in the parade on Jan. 27, 2008 in central Tokyo. Over 810,000 signatures has been collected and were handed in to the government on Jan. 28, 2008. Representatives of the protesters, which include fishery associations, consumer cooperatives and surfer groups, handed the petition to the Cabinet Office and the Ministry of Economy, Trade and Industry. Information in Japanese here from Seikatsu Club. We have updated the CUJ History pages with lots of information from the 1980s, including CUJ’s strong stand against nuclear power after the Chernobyl disaster, as well as food safety issues from the 1990, including the start of the NO! GMO Campaign. We hope you enjoy reading about our active campaigns on a number of consumer issues. Are irradiated food ingredients imported into Japan? Food Safety Citizen’s Watch has more details with a report from a meeting with government officials and food companies. Food irradiation using gamma rays etc. damages the DNA of bacteria and has sterilization effects. Food irradiation has also been used to kill insects and stop germination. 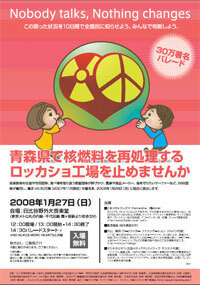 The efforts to promote food irradiation are supported by Japan’s Atomic Energy Commission. The Ministry for Health, Labour and Welfare is making preparations for allowing the controversial technology to be used on spices by the end of March 2008. Against this background, it was reported on June 1, 2007, that Kikkoman Corp. had recalled a product called SoyAct, due to the possibility of irradiation in the United States. Importing irradiated food is illegal in Japan. On November 15, a meeting was held at the Japanese Parliament with Assembly Members from several political parties, officials from the Health Ministry, and from the Food Safety Commission. The Food Irradiation Opposition Campaign Group representing consumers who oppose food irradiation was also present at the meeting. On this occasion, it was pointed out that the biggest problem was to get factual verification whether SoyAct had been irradiated or not in the United States. After Kikkoman had announced its recall, the Ministry of Health sent a letter with questions to the US Food and Drug Administration via the US embassy on June 5, 2007. A formal reply was not received until August 24, but this lacked any details if irradiation had taken place or not. The Japanese government then made a second formal request to get factual verification, but has not yet received any reply from the United States. And only about 2% of the suspect ingredients had been recalled by Kikkoman Corp.
Consumers Union of Japan (CUJ) is a politically and financially independent non-governmental organization (NGO). CUJ is funded by membership fees, sales of its publications and donations. CUJ was founded in April 1969 as Japan's first nationwide grassroots consumer organization. CUJ was officially certified as a non-profit organization on May 1, 2006 by the Japanese NPO legislation. What Is Behind the Cheap Bananas?